$3.00 per 4" x 5.6" card. Customizable wedding thank you card. Choose from two sizes: note card and greeting card. Prices vary with size. Vibrant full color digital printing. 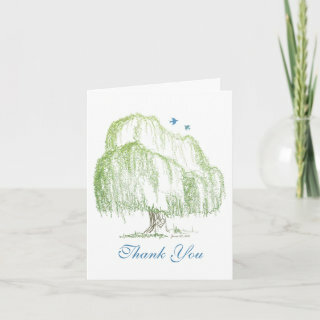 Zazzle's custom note cards and greeting cards can be personalized on all four sides; front and back, inside and out all for free. Printed on ultra-heavyweight (120 lb.) card stock with a high gloss front and back finish. Choose between two sizes: Note card size is 4" x 5.6" (portrait) or 5.6" x 4" (landscape). Greeting card size is 5" x 7" (portrait) or 7" x 5" (landscape). Zazzle cards are printed and shipped in the US, even if ordered off of international sites. Please allow sufficient time for international shipping.